A Legal Registry is simply a list of your regulatory requirements. This includes any commitments that bind your organization to applicable regulations or governmental approvals. To ensure your Legal Registry is effective, it is critical that you link your requirements to Operational Controls. conformance to internal policies & regulatory requirements. are up-to-date and aligned with the current regulatory requirements. 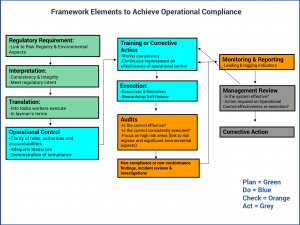 To ensure ongoing compliance, you should actively use operational controls, with integrity. Compliance is not optional. 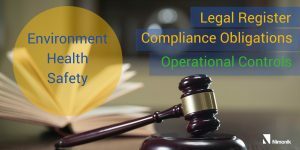 Regulatory compliance can radically improve your organization’s operational efficiency by avoiding errors, issues, fines and other problems before they arise. 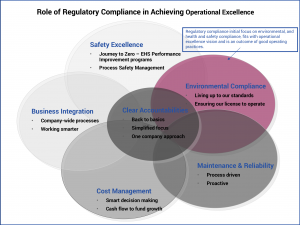 Regulatory compliance is indicative of excellent operations. Unfortunately, there is no silver bullet solution for compliance. It is an outcome of competent workers relentlessly executing operational controls with integrity. The culture of your organization largely influences the integrity of the Operational Controls. Without a culture of integrity that ensures a complete understanding and accountability of compliance obligations, tools, systems, and processes cannot do much. It is your responsibility to establish a culture that ensures operational integrity at all times. You should ensure that workers fully understand the importance of compliance and do not compromise for the sake of production, cost or schedule. To achieve operational integrity at the line level, you should give workers operational respect by communicating what you expect from them. To help workers execute their accountabilities consistently and relentlessly, you should provide them with necessary training and tools. By reinforcing training, mentoring, assessments and corrective actions, you can ensure that workers execute their duties with excellence. It is your responsibility to establish a culture such that workers are confident about returning home safe and sound. Workers should have complete faith in the processes that ensure everyone respects operational controls. Thorough compliance is a natural outcome of a culture that focuses on operational controls. Everyone is accountable for compliance. Successful execution of a Compliance Program relies upon absolute clarity of individual roles and regulatory accountabilities. Not just employees but contractors acting on an organization’s behalf too are able to delineate the regulatory obligations within the scope of their role and all operating procedures. Systems support the development of competencies required to fulfill compliance obligations. Organization’s leaders promote a culture of integrity through what they say and do, and not overtly or inadvertently (by not saying and doing the needed), compromise regulatory compliance and worker safety. Different organizations maintain legal registers in different formats from simple manuals/binders on a shelf to multiple Excel files to in-house software to SaaS. With legal registers on Excel or binders, it is challenging to produce the legislative review logs as compliance evidence at the time of an audit. Often, auditors come across files that are not up-to-date leading to non-conformances. Binders and Excel have their uses but they are certainly not the right tools for maintaining legal registers. If you are using either of these tools you are inadvertently ignoring their maintenance costs. Excel and binders are much more expensive as they are awfully time-consuming and largely inefficient. The cost of inefficiency leading to non-conformances is much higher than investment in a software solution. A software is an ideal tool to maintain a Legal register. You have the choice of using either an external software or building a customized in-house software. The issue with an in-house software is that it is extremely expensive, not just to make but also to maintain. Also if you decide to get regulatory content from an external party, integrating it with the in-house software gets complicated. SaaS is by far the best tool to maintain legal registers. When carefully chosen from the right supplier, it is more robust and much less expensive than an in-house software. 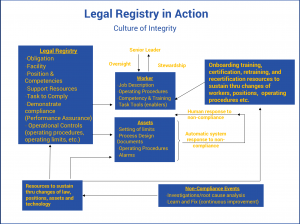 As laws, operations, equipment, products, and services, change, it is crucial to continually update the legal registry. A tedious process requiring precision, the task is best left to analysts who exclusively monitor regulatory changes. The common issue with the outsourced content is the difficulty to integrate it with the software. Improper integration can again lead to gaps in compliance. It is best to look for a solution that produces (not just provides) regulatory content as well as the software. This would ensure that you receive a well-integrated solution without having to invest time in integrating the two. Do we have sufficient workers? There shouldn’t be any vacant roles. Train new workers effectively. To ensure competency and execution of operational controls, all workers should receive the required training. Do workers know what they are accountable for and do they have records of accountabilities, such as job descriptions, access to the operating procedures they rely on? Provide workers with clarity on accountabilities and authority to execute against those accountabilities. Are the assets designed and configured to hardwire best practices with respect to safety, production, and compliance? Are there all necessary operational controls needed to operate the business or assets? Do the operational controls have integrity, are up-to-date, reflect safe and best operating practices, and leverage & institutionalize knowledge of workers? Are processes in place to solicit worker input? Is incident learning embedded in operational controls and implemented for continuous improvement? Do workers consistently and relentlessly execute operational controls? Does management engage in observations, oversight, assessments, coaching, counselling and correcting? Do we learn and implement learning from incident investigations? 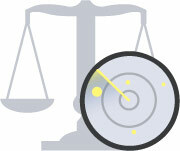 How do we respond to information from lagging and leading metric reporting? How effective is the management review process? John Wolfe is a Partner at Nimonik inc. He has over 25 years of experience in the design, implementation and assessment of integrated HSEQ management systems in multiple industry sectors. He has held HSEQ leadership positions in Suncor Energy, IFC Kaiser, Boart Longyear, CSA and has successfully launched a number of companies, Management Horizons, Green Cone, Total Environment Solutions Trinidad, and Conformance Check. Most recently he was the Sr Director of Operations Integrity Audit at Suncor. John is also well known as an early leader in the sustainability eld having managed the ISO Technical Committees that developed the ISO 9000 and 14000 series of standards and guidelines for corporate reporting, stakeholder consultation and environmental labelling. He was also a founding member of the Canadian Environmental Auditors Association.